Part 1 - Introduction, Part 2 - First Rail Lines and the Birth of the North Carolina Railroad, Part 3 - The Civil War, Postwar Struggles, and the Transportation of Agricultural Products, Part 4 - Passenger and Tourist Train Services, Part 5 - Twentieth-Century Trends and Decline. The outbreak of the Civil War produced an unprecedented increase in railroad traffic. Railroads in North Carolina provided a vital north-south link to the Confederacy, moving men and supplies for Gen. Robert E. Lee's Army of Northern Virginia and connecting the army with the vital port of Wilmington. In 1860-61 the North Carolina Railroad carried 90,000 passengers; in 1864-65, 506,000 passengers, mostly soldiers, rode the line. Freight volume eventually exceeded carrier capacity and piled up at stations along the line. The industry that shouldered this burden had lost many skilled railroad crews and unskilled maintenance workers to the army and was totally cut off from its sources of iron rails, locomotives, and spare parts. Replacement rails were cannibalized from little-used lines. Replacement locomotives were acquired primarily from orphaned Virginia lines taken over by Union forces. The result was a crippling deterioration of track, roadbed, equipment, and service. The invasion of North Carolina by Union general William T. Sherman's army in the last months of the war led to considerable destruction, mostly by retreating Confederate troops, of bridges, track, and rolling stock on the Wilmington & Weldon Railroad and on the North Carolina Railroad between Goldsboro and Raleigh. Union forces, equally dependent on the railroad for supplies, repaired the damage almost as quickly. At the end of the conflict, the state's railroads were in a shabby condition, due more to lack of maintenance and overuse than wartime destruction. Recovery occurred relatively rapidly with the assistance of the federal government, which sold off captured rolling stock on easy terms, and the repairs made by the Union army. From 1865 to 1875 the state government issued almost $18 million in bonds to 13 different railroads. But during the inept administration of Governor William W. Holden, most of these funds were lost to corruption and extravagant spending at the hands of North Carolinians like George W. Swepson, the first president of the Western North Carolina Railroad, and northern carpetbaggers such as the infamous Milton S. Littlefield. Nevertheless, the state witnessed the roads' expansion from 984 miles to 1,356 miles of track in the first postwar decade. The national economy experienced numerous booms and depressions in the last quarter of the nineteenth century, and railroads often were forced to file for bankruptcy during economic downturns. The entire industry began a period of consolidation that continued throughout the next century. Southern rail companies, which tended to be capital-poor, were frequently takeover targets. In 1871 the Pennsylvania Railroad established a holding company, the Southern Railway Security Company, to gain control of strategic southern railroads and build a network connecting major southern cities, including Richmond and Atlanta, with its northern rail lines. When it took over the Richmond & Danville Railroad, to which the state of North Carolina had leased the North Carolina Railroad for 30 years for $260,000 per year, the Pennsylvania Railroad acquired access to the strategic Charlotte-Greensboro route. But rail traffic never met expectations, and the holding company collapsed in the aftermath of the financial panic of 1873. With the revival of the economy in the mid-1880s, the state's railroad companies embarked on a new round of tracklaying, with mileage doubling to 3,128 between 1881 and 1891. Dozens of short-line railways were constructed in the 1880s. Passenger traffic continued to decline, but freight revenue accelerated. The port of Norfolk, Va., became a prime destination for agricultural commodities heading to the industrial Northeast by ship. Cotton production increased rapidly after the Civil War, while wheat and flour shipments declined as grains from midwestern states took over the market. The railroads carried guano fertilizer-arriving by ship in Norfolk from South America-into the Piedmont at reduced rates to encourage the development of commercial agriculture. 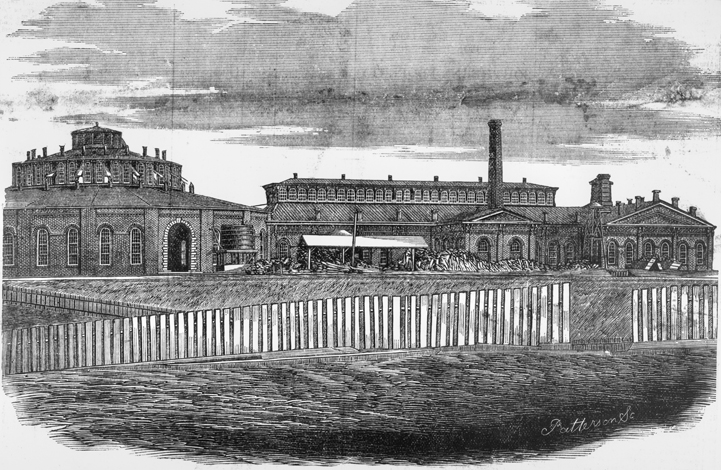 Substantial quantities of manufactured goods from the Northeast also entered North Carolina by rail, as did Virginia tobacco being transported to Durham and other destinations. Overall, the railroad perpetuated the state's economic role as a producer and exporter of commodities and an importer of manufactured goods. Although the return of depression and railroad defaults in the 1890s slowed construction of new track, company reorganizations and consolidations continued apace. 1 January 2006 | deTreville, John R.; Wait, Douglas A.